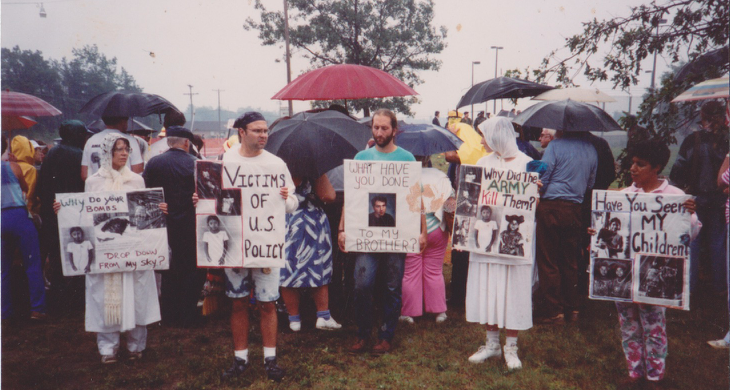 In 1990, several people from West Michigan participated in an action at Wurtsmith Air Force base near Bay City, Michigan. This action was part of a multi-year campaign that targeted the military base because it was a Strategic Air Command base, also known as SAC. These bases had nuclear weapons at all times and flew B-52 bombers with nuclear weapons on board. Some of these B-52s were in the air constantly, so as to make sure that some nuclear weapons could not be easily targeted while on the ground. The cost of these weapons and to fly them on B-52s was astronomical. I was one of those who took part in the action at Wurtsmith Air Force base in August of 1990. The group of people with whom I went with decided to model our action after the Mothers of the Disappeared throughout Latin American, carrying images of loved ones who had been disappeared or murdered by government death squads (pictured here above). However, the picture I was holding was that of my brother Steve, who lived with my parents because of a serious disability from his infancy. The Michigan legislature had made serious budget cuts earlier that year and the program that my brother benefitted had been cut. Therefore, I considered him to have been discarded by the state and amongst the victims of state violence. I was arrested that day, along with dozens of other protestors at the US military base. We were all released on bond and waited a court date. When I received my court date I sent the court a letter saying I refused to come since I didn’t believe that the court would act justly, especially since we could not use International Law as a defense. The court sent a second letter and I wrote back again saying that I would not come. A week later two federal agents showed up at my front door to arrest me. I was out back and was informed by my housemates that these two men were looking for me. I left and spent the next three months underground, moving from place to place, hoping to avoid arrest. The video below, is an interview that Wenjo Carlton (who produced a show on GRTV at the time) had conducted with me while I was underground. This is part one of a two part article on the action I took part in against nuclear weapons and US militarism in 1990. Part II deals with the aftermath of me being picked up by federal agents and the outcome of my trial, which includes another interview by Wenjo Carlton. This entry was posted in Anti-Nuclear Movement, Anti-War/Anti-Imperialism and tagged anti-nuclear action at Wurtsmith Air Force base in 1990, Jeff Smith on GRTV, nuclear resister goes underground. Bookmark the permalink.